You’ll not be able to Sync Mailbox. When trying to add another Email account. Mostly happens when trying to sync using an operator provided internet connection. You don’t have to worry as i have come up with the solution. Here is an article on “How To Fix Error Code 80072F30 in Windows Phones” which would solve your problem. I am sharing few methods to fix Error Code 80072F30 as there is no specific fix or solution to this error code 80072F30 in Windows Phones. Follow these methods until the error Code 80072F30 gets solved. 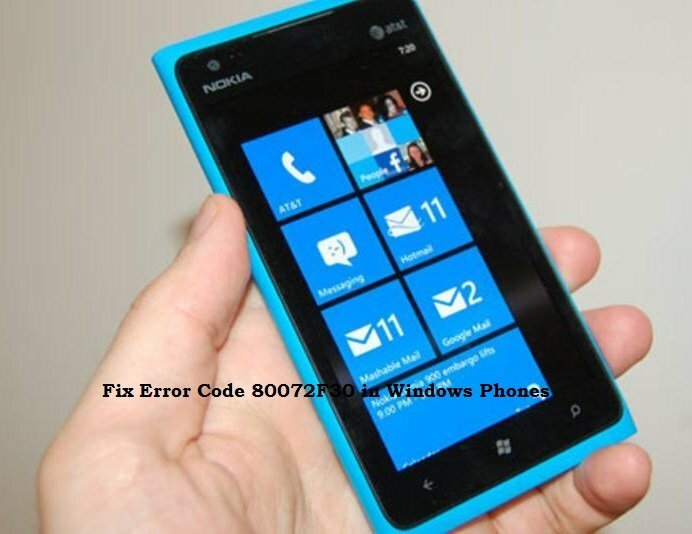 Here are four methods to fix or solve error code 80072F30 in Windows phones. Check these methods one-by-one and apply them until the problem gets solved. Set your Date and Time Manually. See here on How to do it. Go to: Settings –> Date and Time. Set Date and Time Manually. READ ALSO: How to Delete History in Microsoft Edge? Most of the Users facing this problem Solve / Fix Error Code 80072F30 in Windows Phone using this method. Sometimes this happens just because of the reason that Internet APN and the access points in the customer data plan are not same. To check and update the APN settings. Call the Customer Care and ask for the APN settings (Make Sure to Setup APN Manually). Go to: Settings –> Access Point –> Add. Check if the Settings are same as described by the executive or re-add them. If the above method is not able to fix or solve this error code 80072F30 in Windows Phones then try the below one. This happens because the date on the server side and on the device are not same. The only way to fix using this method is to contact System Administrator and check for the right date and time. If they are not same then correct to fix this issue else try the next method to fix error code 80072F30 in Windows Phones. Sometimes this is found that this error is fixed by correcting the Inbound and Outbound Settings. I know most of the people are not aware of these settings but they are easy to find and even easier to correct them if they are not. Go to: Settings –> Email + Accounts. Now look over the internet for the right inbound and outbound settings for your Email Server like Gmail, Yahoo and more. Tap on the account to check the inbound and outbound settings in your Windows Phone Device. Compare the settings with the internet ones. If they are not correct, Correct them. If you are unable to correct them, then delete the account and reconfigure according to the the given inbound and outbound settings provided on the internet. Now, error code 80072F30 in Windows Phones has been solved. You can now sync Mailbox on Windows Phone 8 even using an operator provided internet connection. How to Change Downloads Folder Location in Windows 10? How to clean up Windows 10 PC without OS reinstall? I am getting this error frequently. Whenever there is an mobile network non-availability, I face this issue. If I switch off and switch on again, normally gets corrected automatically. Any suggestion to solve this ? Switching off and on again is a temporary solution to this problem. You should try the methods shown above. Hopefully one of them will solve your issue. I had this problem when sending mail on one of my accounts. When I set time and date to manual and composed a new message with this setting, the mails started to be sent again. Thanks for the tip! Date and time method worked fine for my windows phone. Had a lot of trouble over this issue. Thank you for your help. Hello thanks for above but none have worked for me. Should I reset my phone and start again. Any advice would be appreciated. not sure why, but I had to manually choose the Baja California time zone and NOT the PST time zone. If I chose PST, it still gave me the error. I also used the manual POP account to set-up my email instead of the Outlook/Live/Hotmail option. Thanks. O365 stopped working after the DST change. Switching to manual time setting fixed it. Too bad Microsoft couldn’t fix it…as usual. Remove the battery , then reinstall. It usually works.